On a London street, four unlikely friends stand before the astonishingly ordinary-looking blue door of the Magic Circle . . . Alex doesn't say much, and once jumped when handed a satsuma, but, wow, is he amazing with a deck of cards. Zack is undoubtedly one of the best pickpockets in the country (but always puts things back). Sophie once convinced her Brown Owl that all the other Brownies were jellyfish thanks to her nifty hypnosis skills - and then never returned. Jonny - who is quite possibly the tallest boy in the universe - mixes science and magic with spectacular consequences (mostly explosions). 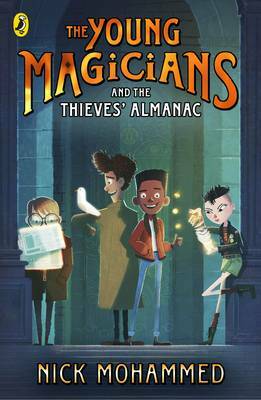 Join these young magicians as they step inside the world-famous conjuring club in an adventure that may or may not involve the search for a secret book, a set of impossible crimes and . . . oh, yes - a flock of very confused pigeons.Intrigued? Confused? Well, you're just going to have to decide for yourself, AREN'T YOU?